Is there any activity more Canadian than outdoor skating? 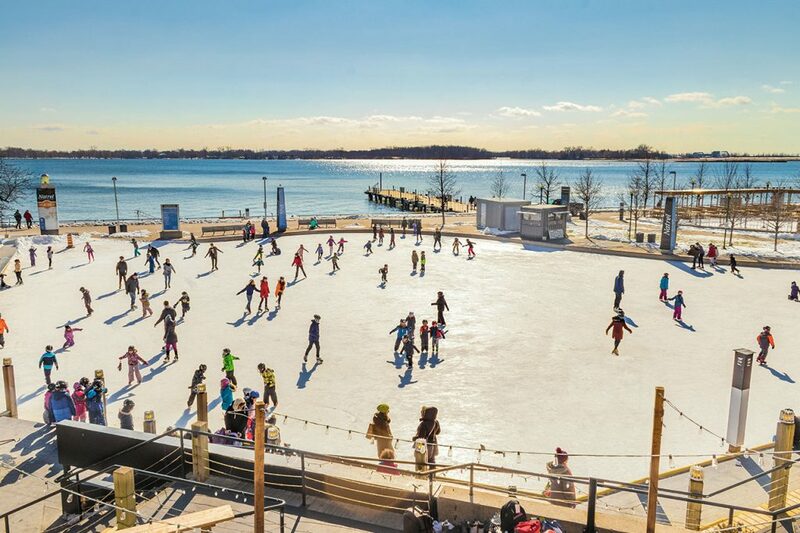 Toronto is spoiled with numerous well-kept rinks and skating trails, so bundle up, brave the cold and give these five spots a spin. 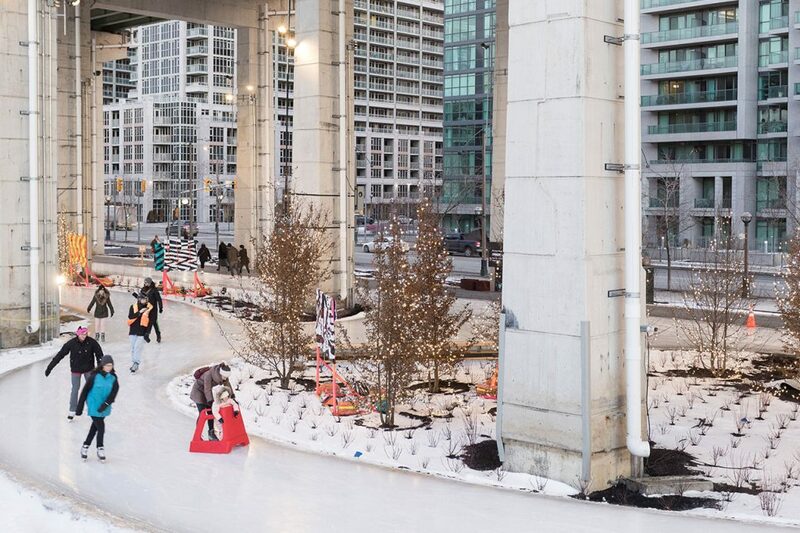 The Bentway’s 220-metre long skating trail winds around a space beneath the Gardiner Expressway, and often features art exhibits, events, and specialty lounges offering treats and beverages for warming up. Admission is free, and skate rentals are available. Visit on a Thursday night for free skate rentals from 5-9 p.m., courtesy of Billy Bishop Toronto City Airport. Skate lakeside at Harbourfront Centre’s Natrel Rink for beautiful views of both Lake Ontario and Toronto’s skyline. Visit on Saturdays from 8-11 p.m. for DJ skate nights (on until February 16) and enjoy free skating with a side of music, or if you’re looking to improve your skills, sign up for weekly lessons. There are heated change rooms on site, as well as skate and helmet rentals. 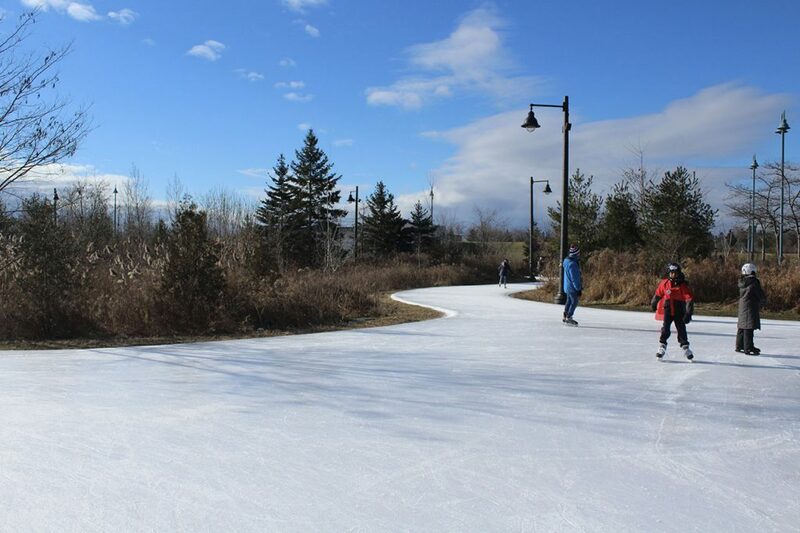 Located in Colonel Samuel Smith Park at Kipling and Lake Shore, this ice trail is well worth the trip from downtown. The large figure-eight trail starts beside the Power House Recreation Centre, which was built in 1937 as part of the historic Lakeshore Psychiatric Hospital, and takes you through wooded areas to give you the feeling of gliding through a forest. Admission is free, but bring your own skates. Toronto’s most famous skating rink attracts crowds looking to hit the ice and to snap pictures with the iconic ‘Toronto’ sign. 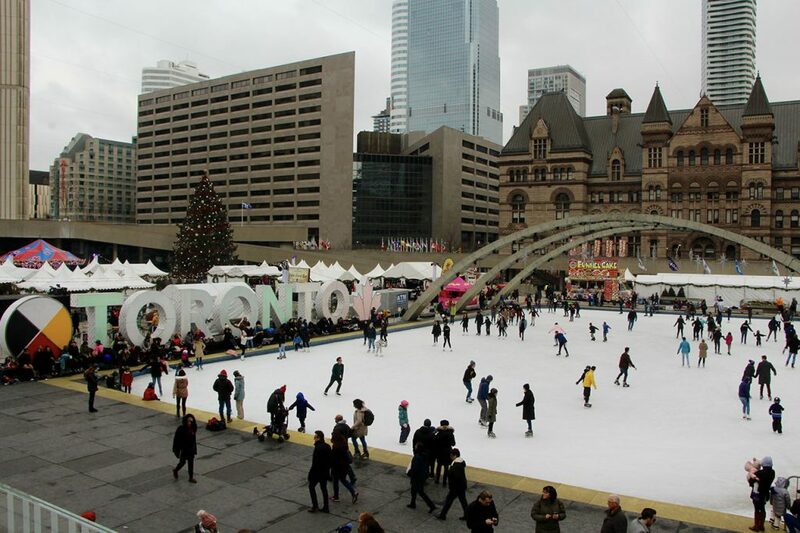 This rink’s central downtown location and proximity to City Hall and the Eaton Centre make it a busy destination for a winter outing. With free admission, on-site skate rentals and skate sharpening, it’s a convenient spot to stop by for a few laps. 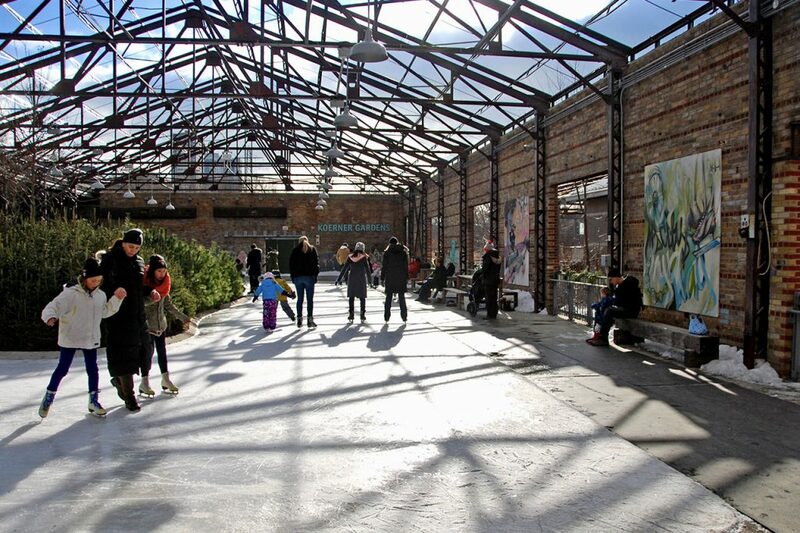 Evergreen Brick Works’ Winter Village features a picturesque skating trail that circles islands of greenery. After a few laps, take an off-ice break with street curling, bocce ball or giant Jenga. 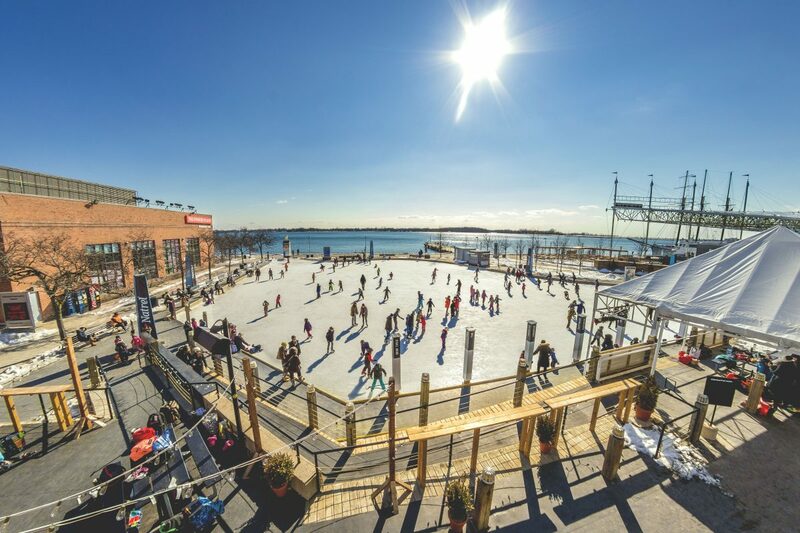 Visit on the weekend for free public skating and $5 skate rentals, or stop by on Winter Wednesdays for an evening skate, a bite to eat from a local food truck, and a drink from the Sipping Station. Click here for more stories about Toronto.